Well...I guess the wallpaper looks a bit sad and melancholic but I still hope that you'll like it! Very interesting... you are right though it is sad. I do like the water effect of it though adds alot to it. this is incredible. ^^ is this your first? honestly im really blown away. i love the mood, the ambience and the setting. this is very good work there girl..
critique: what will bring it together is the red stripe in the bg matching the color of her dress. some minor extraction glitches here and there but that is not important.. an overall texture or a very subtle filter will help the blending a lot. but anyway great composition... you'll be ready to kick in the top submissions in no time..
keep them coming Regenbogen (what does your name means by the way). I like the melancholy XD ::that sounds sadistic:: and I love the soft palette of this wall. 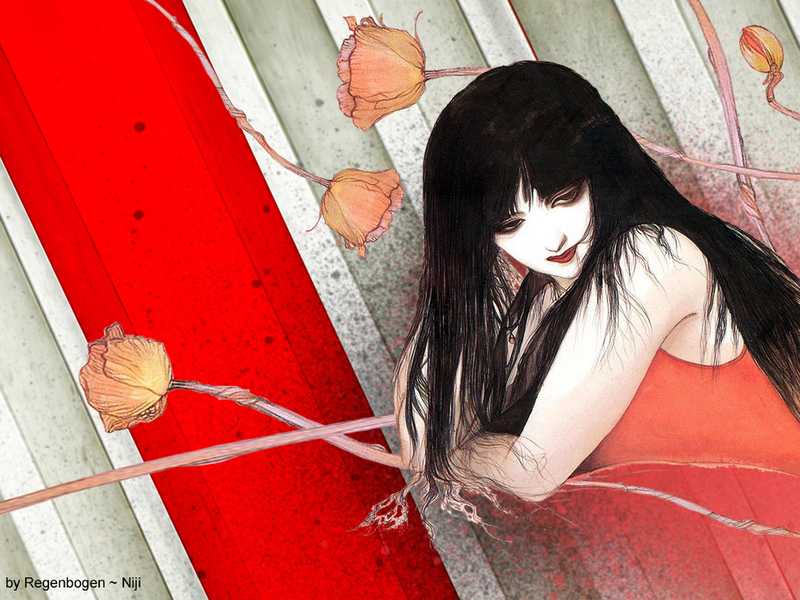 I know it's nearly impossible to extract Amano's work, but I think some textures would blend the girl and the flowers more into the background. Also, maybe you should add a ledge for the girl to lean on: she looks sort of weird cut off like that. A great idea with this patch of red in the background. The extraction could be better, but hey, an artist has to start off somewhere, right? Lol true. It's nearly impossible to extract Yoshitaka's scans, his hair is always in strands. But maybe some blendings with the character scan mode could work. But hm, the background is really meaningful, plus it matches the scan for the redness exists and presented really well. Overall, it's a nice work. ^^ But it gives me the heebeejeebees? (how do we spell that word) and scariness coz now it's 11.52pm, and Yoshitaka's work makes me feel uncomfortable. ^^ But still, don't mind me. It's a pretty neat work overall.